St. Dominic’s starting point was the Gospel and out of that he began a movement to preach Jesus Christ. He probed the questions of his time with the ‘humble intelligence of the heart’ . And so we find ourselves, Dominican women – a small Congregation with Mission Areas in South Africa, Latin America, Ireland and three sisters in Louisiana and a Trust (Fundação) in Lisbon, who want to be faithful to Dominic’s dream of bringing the Gospel to the people, in the light of our Mission Statement which has served us so well and remains ever more relevant. Our Dominican way of life is an expression of who we are and who we want to be in today’s turbulent world which is begging for a response from us. Dominic, in his travels with Bishop Diego, became fully aware of the needs of that time. In his dark nine-year stay in Fanjeaux, he would not have known at first how to respond to the needs he saw . He was aware of the urgency to preach the truth. Seignadou was the moment of vision when he saw more closely the choices he would make. Dominic loved women and founded a community of women in Prouille to support the mission. Thus, our roots as Dominican women go back to Prouille. Today, we affirm the presence of women at the ‘table of life’, empowering and supporting one another in community and advocating for the dignity and rightful place of all women in society and in the Church. And who are we? We are a community of Contemplative Preaching gathered around the table of life. We are called to love, in and through community and, we seek to re-imagine ways in which we can be attentively present to the Word of God, to one another, to creation and to human needs. Dominic recognised that the mission to preach was the raison d’être for founding of his Order. We are called as Dominican women to reach a fresh understanding of mission today. We participate in this mission through our prayer and engagement, and through sharing resources. Dominic preached the truth in love. He heard the cry of the Albigensian and sat down with the innkeeper to debate his beliefs. What cries are we hearing today? As Dominic, rooted in the Word of God, took on the simplicity of the Albigensian way of life but disputed their beliefs, we are called to respond to the cry of the earth, the cry of the poor, the anguish of migrating peoples, the horror of human trafficking, and the increase of violence in our world, and to try to make ecology integral to our life. Dominic prepared himself for the preaching mission through study – especially on the Gospel of Matthew and the letters of Paul. Study is at the heart of our Dominican charism. ‘A place at the table’ implies a contemplative stance nourished by study for the sake of mission, and an evolving understanding of God and God’s Reign, and of all matters pertaining to our vocation as preachers of the truth. and are called to commit our prayer, time and talents to this endeavour in order to invite others to take a place at the table. We affirm the centrality of formation for new members and as a life-long responsibility for us all. Dominic lived the mission God entrusted to him in a spirit of collaboration. Mission must be at the heart of collaboration. We are invited to live with all in oneness, peace and co-operation for the common good, in the midst of a broken, suffering world. Taking our place at the table, we are called to deepen the sense of the sacredness of life as we collaborate with the Dominican Family and others. 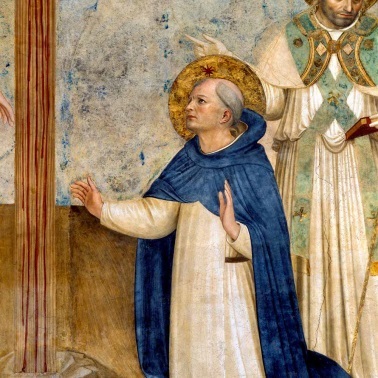 Dominic’s last words to his brethren were – “Have charity for one another, guard humility, make a treasure of voluntary poverty.” It is his last will and testament to us eight hundred years on.